Brightmark Energy has revealed that it has launched its biogas project in Yakima County, WA, that will convert dairy waste into renewable natural gas (RNG) and other products. The anaerobic digestion facility will process up to 150,000 gallons of manure, producing 160,000 MMBtu of RNG that will be cleaned, upgraded and compressed before being injected into the nearby Williams NW gas transmission line for sale as fuel. The project has been valued at US$20 million and is just one of a number of developments that Brightmark is undertaking across the country. On 1st April, work officially commenced on the construction of a new biogas plant in Højslev. The facility will feature 14 of Stallkamp’s digesters which will treat around 400,000 tonnes of agricultural, animal and food waste each year, though its maximum capacity is 600,000 tonnes. Construction work is expected to be completed later this year, with gas injection due to start by December. US$2,521 million worth of projects were covered by our researchers last week, including 22 new additions and 24 updates. Biogas projects in the US – including updates to a US$20 million project in Wisconsin. Tyre/rubber recycling facilities – including recent coverage of two developments in Australia. Biomass in Brazil – including new updates to three projects in the past month. A tax on waste incineration may soon be coming to the UK. What’s all that about? 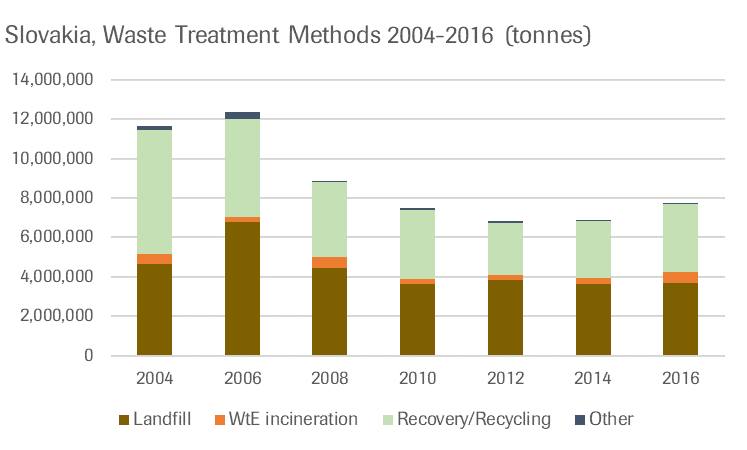 The landfill tax has had great success in reducing landfill volumes, and there has been a well-documented rise in WtE incineration, both in terms of volume and monetary investment. It seems that the government now thinks this has gone too far, and corrective measures are needed to boost, not landfill, but greater and greener recycling methods. The subject, unusually, reached Prime Minister’s questions in the House of Commons this month. West Wiltshire MP, Dr Andrew Murchison, asked ‘Will the Government strengthen their bid to host the 2020 United Nations climate change conference by putting a moratorium on new incinerator, gasification and pyrolysis applications, including the one in Westbury [see here for AcuComm’s coverage of this project], in my constituency?’. To which the prime minister replied ‘We want to maximise the amount of waste that is sent to recycling rather than to incineration and landfill. Waste plants continue to play an important role in reducing the amount of rubbish that is sent to landfill, and we welcome the efforts to drive it down further. but if wider policies do not deliver our waste ambitions in the future—including those higher recycling rates—we will consider introducing a tax on the incineration of waste’. The PM’s reply was taken more or less directly from the report outlined below. What was interesting about the question was that it lumped newer technologies such as gasification and pyrolysis together which traditional WtE facilities. All much the same in the eyes of campaigners, one suspects. A tax might also, of course, incentivise CHP over current investment patterns, although the government does not explicitly say this. The idea of an incineration tax means different things to different people, depending on the desired outcome. Neil Grundon, of Grundon Waste Management, has a slightly different take. 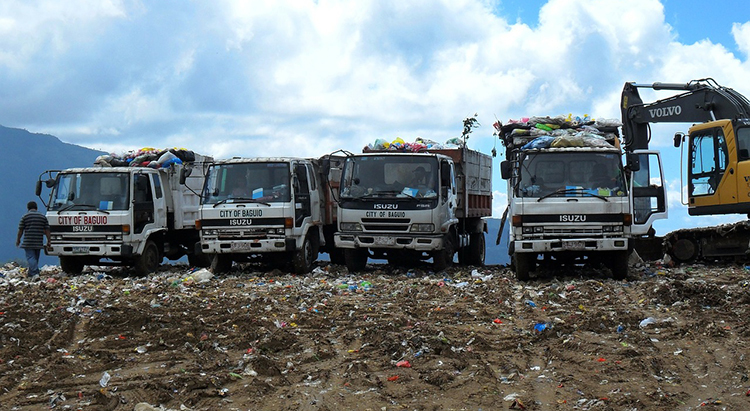 Writing on the CIWM web site in November 2018, he argued that the landfill tax has led to an increase in RDF exports rather than investment in domestic waste treatment capacity. A tax on RDF exports, rather than incineration itself, would, therefore, discourage these exports and provide cash for domestic investment in new, greener, treatment methods. Large incinerators would be taxed, to encourage the development of smaller, locally-sustainable facilities. There is certainly a trend towards the construction of large – maybe too large – WtE facilities, which promise better economies of scale and greater return on investment. As we saw recently with Tata’s planned Cheshire facility, one objection raised is the inability of such large sites to survive just using local waste, whether in RDF or unprocessed form. The export tax idea raises a couple of interesting issues, however. Firstly, it should be noted that this isn’t remotely what the government appears minded to introduce. Secondly, in regards to waste and, by extension, RDF as a problem to be dealt with, rather than a commodity with value. RDF exports are presumably profitable for the companies exporting them, and a worthwhile purchase for the overseas receivers. While an export tax would provide a clear benefit for local operators such as Grundon, it’s hard to see why any government should be keen to explicitly suppress a profitable export trade in this way. Whatever the details, the broad direction of travel seems clear. To mix a metaphor, the UK seems to be aiming to move the circular economy up a gear. Where once the incentive was the reduction of landfill to the benefit of WtE and recycling, it is now to be the reduction of landfill and WtE, to the benefit of recycling alone. This may have profound implications for the industry, with smaller CHP-style units replacing the traditional incinerators and even perhaps gasification/pyrolysis technologies. In some ways, we’ve been here before. The UK pioneered waste incineration in the 1800s*, before abandoning it in favour of sanitary landfill in the mid-20th Century, and then re-embracing it in the 2000s in the wake of the landfill tax. So again today, the regulatory environment is not standing still. Planners must be aware of this changing environment and adjust their strategies accordingly. * for anyone interested in the early history of UK waste incineration, I’d recommend ‘’The incineration of refuse is beautiful’ : Torquay and the introduction of municipal refuse destructors’, by J.F.M. Clark, Cambridge University Press, 2007. You can read it online here. On 30th March, Zuzana Čaputová was elected as Slovakia’s President with 58.4% of the vote. When she is inaugurated on 15th June, she will simultaneously become the country’s youngest-ever President and its first female. Her victory marks a triumph for liberalism and progressive politics in a region which is known for conservatism and populism. The link to the waste industry? Prior to her political campaign, Zuzana Čaputová was a lawyer who won a 14-year legal battle, culminating in the European Court of Justice, representing the residents of her home town Pezinok against the municipal authority’s attempt to establish a landfill close to a residential area. It was a fight, not against the waste industry though, but against corruption. Waste is a lucrative avenue for organised crime in Eastern Europe, with a plentiful supply of land for landfill sites that is cheaper than in Western Europe and a plentiful supply of illegal waste that can prove to be a good source of revenue for those who can dispose of it. Slovakia’s President-elect is a strong supporter of the EU and it would come as no surprise to see this allegiance rewarded with an inflow of EU funding for development – with legitimate waste infrastructure projects being a key recipient. Landfill has been Slovakia’s main method of waste disposal since 2010 (see graphic). Earlier this month, LEAG revealed that it is exploring the option of developing a waste-to-energy (WtE) and treatment/recovery plant at its industrial site in Jänschwalde. The facility would process thermally treated, non-recyclable waste, with energy generated potentially being used for district heating, process steam and power generation. Keep track of this project. Carbon Clean Energy Inc is developing a C$285 million wheat-based biofuels facility in Alberta. The plant, which is the first of its kind and will feature state-of-the-art facilities, will produce 160 million litres of denatured ethanol, 1.76 mmBtu of biogas and 12 MWh of green power each year. US$2,848 million worth of projects were covered by our researchers last week, including 17 new additions and 34 updates. WtE plants planned in Germany – including two projects covered in 2019. Wheat based biofuels – including a first-of-its-kind project in Canada. PET recycling facilities – including coverage of three projects this month. The UK’s Renewable Energy Association has published the first instalment of its three-part Bioenergy Strategy, which will review the potential of bioenergy in the UK and the policies needed to deliver its potential by 2032. The first part examines the state of play in the sector, noting that bioenergy now meets 7.4% of the UK’s energy requirements, including 11% of electricity demand, 4% of the energy required to produce heat and 2% of the transportation sector’s needs. Its benefit to the environment has been a 4% reduction in greenhouse gas emissions, while the benefit to the economy is valued at £6.5 billion and the provision of 46,000 jobs. According to the Department of Business, Energy Innovation and Science’s ‘Digest of UK Energy Statistics’ (DUKES) 2018, the contribution of bioenergy and wastes to UK energy supply has grown by a factor of more than 2.5 in the last ten years, from 250 to 623 Petajoules/year. The importance of the sector is destined to grow even further. The UK’s Committee on Climate Change has concluded that bioenergy could provide up to 15% of UK energy demand in a low carbon economy by 2050, highlighting the important role bioenergy with carbon capture and storage (BECCS) could play in decarbonising sectors such as aviation. However, the REA points to the pipeline for future bioenergy projects being constrained by current government policy which has reduced Feed in Tariffs and adversely changed the requirements for biomass projects under the Contracts for Difference (CfD) scheme. The REA believes that no bioenergy projects are likely to be brought forward under the third round of the CfD which launches in May 2019. The next stage of the REA’s Bioenergy Strategy will involve the development of a vision of the role that bioenergy could play in the future UK energy economy. This will look at the potential role of sustainable bioenergy in the long term (to 2050 and beyond). Importantly, the project will also focus on what contribution bioenergy can make to UK energy economy in the short term and specifically to the end of the fifth carbon accounting period in 2032. This approach recognises the inevitable uncertainties in the long term, the benefits of making early reductions in greenhouse gas emissions, and the need to maintain momentum so that technology solutions, expertise, supply chains and infrastructure needed later on can be preserved and progressively developed. It will estimate the environmental and economic benefits that realising such a vision could provide, along with the costs. The third phase of the project will build on this vision and look at what government, industry and other players will need to do to enable it to be realised. 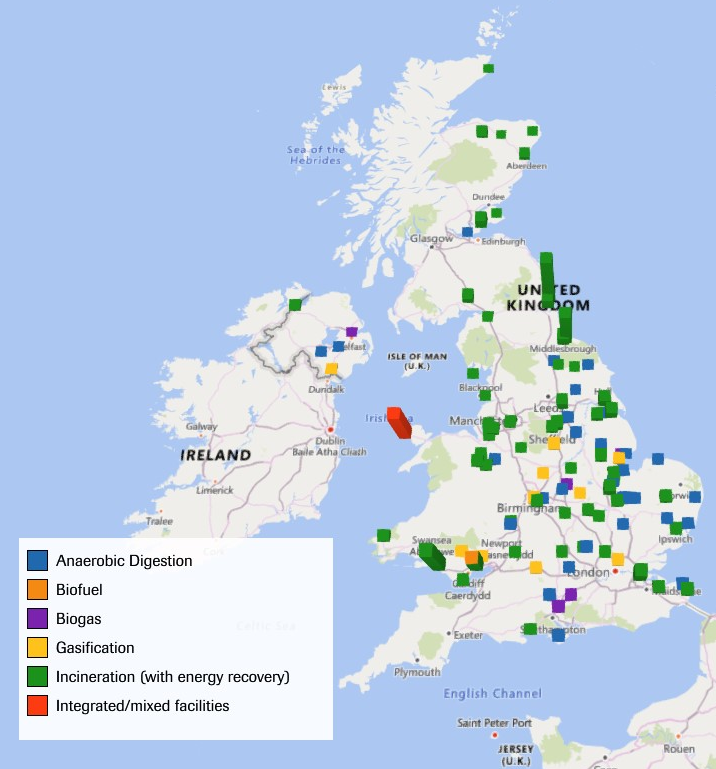 UK Bioenergy Projects. Source: AcuComm WasteView Projects database, April 2019. 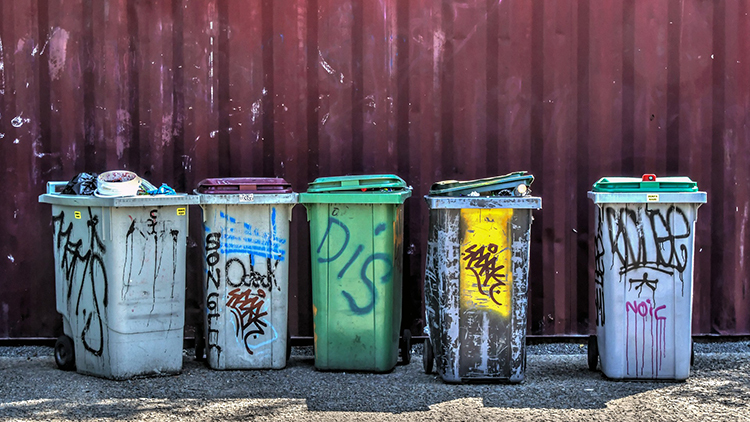 We’ve seen in recent articles how waste management can often be overlooked, or at best an afterthought, in the wider business of urban planning. West London looks likely to have to dismantle a new WtE facility in order to accommodate the city’s growing air transport needs. And in many Chinese cities, state-encouraged urban growth has led to waste generation outstripping existing means of treatment. But that’s not always the case. On 7th January 2019, the Danish Government and Hvidovre Municipality announced an agreement to initiate the work to build nine new artificial islands as part of what will become the largest land reclamation project in Scandinavia. 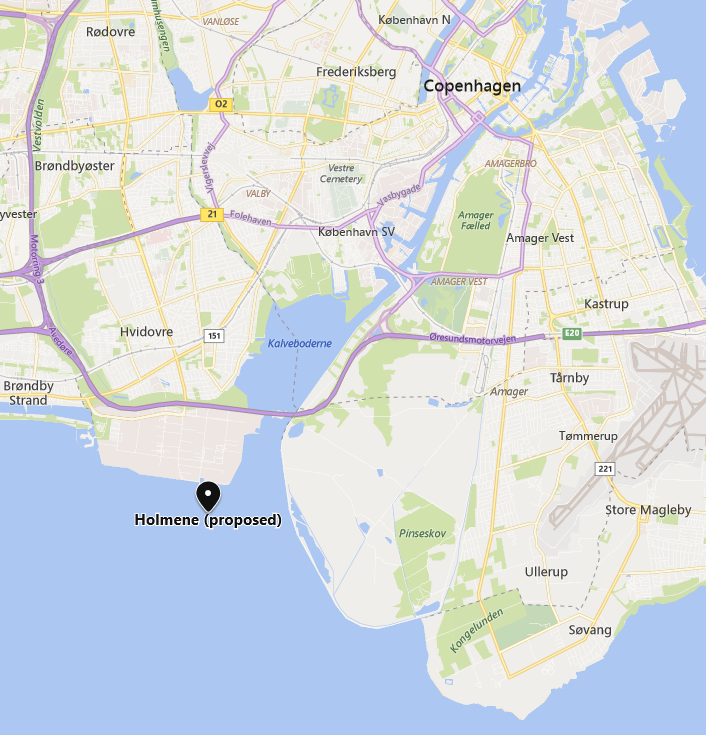 The project, entitled Holmene (‘the Islets’), will comprise 3 million square metres of land, located 10 km south of Copenhagen. The largest of the nine islands will be reserved for the development of green technologies, including what will be the biggest waste-to-energy (WtE) plant in Northern Europe. Along with related biowaste and waste water facilities, the project will be able to generate around 35 MW of electricity, enough to fulfil the present needs of around 25% of the population of Copenhagen. The project is ambitious, and work is expected to begin only in 2022. The first islet, which will be home to the WtE plant, will be finished by 2028, and the whole project will be completed by 2040, according to current plans. The project’s designer is Urban Power, based in Copenhagen. There are a few other large integrated projects of this nature around the world. One is Hong Kong, which is currently building a range of waste management facilities on an artificial island. The centrepiece is a 55 MW WtE plant capable of handling 3,000 tonnes of waste per day. The site will also include an MBT plant and wastewater processing facilities. The project was first mooted in 2008 and received approval in 2015. Work on land reclamation began in 2018. The WtE plant is due to become operational in 2024. While planning ahead is clearly laudable, there are pitfalls. Large projects are more prone to delays, be they technical, regulatory or financial. Those delays may have nothing to do with the waste management component. Also, project management is more of a challenge, as a range of companies need to be involved, with different and possibly competing priorities and areas of expertise. Finally, attempting to plan for needs decades in advance runs the risk of getting those needs wrong, on either the high or low side. But on balance, it’s surely far better to try to look ahead. Enviroserve UAE has officially opened The Recycling Hub – the world’s largest integrated e-waste recycling facility – in Dubai. The plant, which can recycling the full range of electronic equipment, has the capacity to process up to 100,000 tonnes of waste each year. It is also capable of recycling specialised waste material such as aerosol cans and lightbulbs. FCC Environment and Copenhagen Infrastructure Partners have reached financial close for the Lostock Sustainable Energy Plant located in Cheshire. The facility will be equipped with two furnace-boiler lines and will process up to 600,000 tonnes of municipal solid waste (MSW) each year. The resulting energy produced will power up to 110,000 homes. Is technology moving faster than the regulators? Last week I touched on a major problem for developers of new waste plants in Europe: the sheer length of time it can take for a new facility to gain approval and come to fruition. There’s a stark contrast with, say, China, where new plants seem to be announced every week. A good example is the Lostock SEP (Sustainable Energy Plant). This is being sponsored by Tata Chemicals Europe. E.on Energy From Waste was originally involved, but Tata has now replaced this with a new consortium (see below). Click the map to view the plant’s exact location. AcuComm’s entry for the facility can be found here. It is based on the site of a derelict power station at Lostock, just outside Northwich, Cheshire, UK. The power station closed in 2000 but has yet to be demolished. Tata originally proposed the creation of a large waste-to-energy plant in 2010. This would burn RDF, not raw MSW or biomass, generating 60 MW of electricity. Annual capacity would be 600,000 tonnes, equal to around 1,800 tonnes per day. This is more than is generated locally, so RDF would have to be transported from other parts of the country by road or possibly rail. Conditional planning permission was given in October 2012. Tata fulfilled these conditions in 2017, and filed a planning variation application in 2018 to increase the power output to 90 MW (gross). This led to a number of objections, focused on potential extra traffic as waste is shipped to the site, and potential changes to the nature of the waste burned. Tata’s response to the objections – principally that the plant will simply be more efficient than originally planned – satisfied the government, which gave no objection to the extension in June 2018. In March 2019, a deal was announced which will allow full construction to go ahead. Tata has agreed a deal with a consortium of companies. 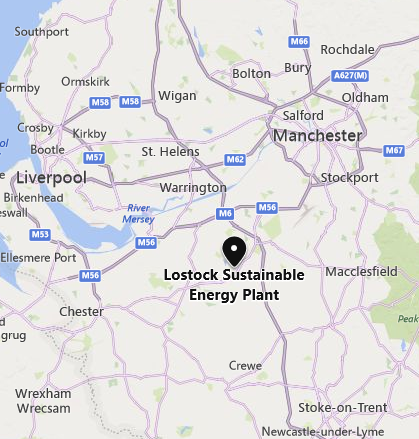 Under this, Lostock Sustainable Energy Plant Ltd will own, construct and operate the facility. LSEP is a joint venture between FFC Environment (the local waste collection company) and Copenhagen Infrastructure Partners. Construction will be undertaken by a consortium headed by CNIM. The current plan is to have the new facility operating by the end of 2023. This will be a full 13 years from the original planning application in 2010. Planning delays can be blamed for some of this. The 2018 extension of the plant’s power output is an interesting element. Tata has noted that new technologies rendered the original planning consent obsolete in this respect by 2018, as far greater power output can be achieved with the same inputs. In other words, the technology available to the market has moved far quicker than the planning process is able to allow. This claim has been widely disbelieved by opponents, who say that such a large power increase must be possible only with greater inputs or different inputs. That, on the face of it, is not an unreasonable assumption. Tata’s ability to demonstrate otherwise to the government suggests that this is an industry where what is possible has changed rapidly, since even 2012. The other point to note is that Tata has not brought this project to its current state of development alone. Tata is not a specialist waste company and has had to assemble an international coalition of partners in order to bring the necessary expertise together. Such undertakings are never quick and not guaranteed to succeed, as indeed was originally the case with E.on in this example. Finally, the Lostock site is already home to another major waste project. This is unrelated to the LSEP, although FCC Environment is also involved in the supply of waste. The Renescience plant is an MBT facility which sifts out recyclables and turns the remainder into either bioliquids for fuel/electricity generation, or RDF. The site is smaller, generating 6 MW, and has taken far less time to bring to fruition. Planning was granted in 2015 and construction work began a year later. After a short delay, the plant became operational in 2018. Written by Andy Crofts, Chief Data Analyst.